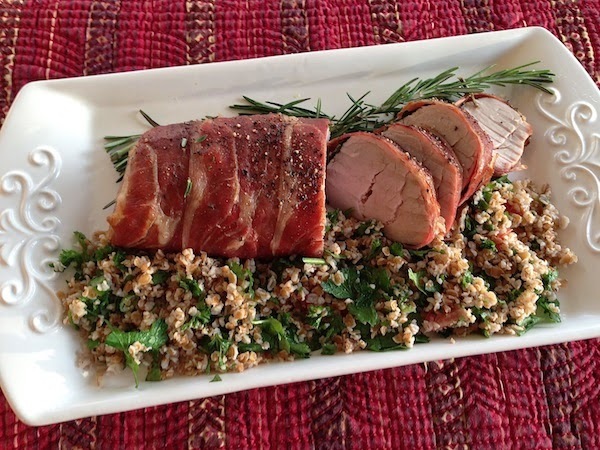 How do you turn a savory pork tenderloin into the most heavenly mouth-watering entree ever? You wrap it in prosciutto (a dry-cured ham sliced very thin). Very easy to prepare and a magnificent meal worth repeating! Preheat oven to 425 degrees. Rinse and pat dry pork tenderloin. Align the 4 strips of prosciutto length-ways (overlapping each layer a bit). Place the pork tenderloin on top of the prosciutto toward one end. Sprinkle a little bit of chopped fresh rosemary and thyme on top and then sprinkle with fresh pepper. Taking the end of the prosciutto, start rolling tenderloin. After tenderloin is wrapped in prosciutto, place tenderloin in a baking pan, with the end of the prosciutto facing down. (I lined the pan with aluminum foil first for easy clean up). Place in preheated oven and bake tenderloin for 30 minutes or until the center temperature reaches approximately 140 to 150 degrees. Remove to a platter and slice tenderloin into 10 thin pieces. Serve with your favorite healthy side dish. Enjoy! If you'd like a printer-friendly version of this recipe, Click Here. "Let us gather at the table, eat, laugh, and make memories."